There is something very lovely about a book which talks in detail about food. A book that describes the ritual of cooking and eating in a way that makes you taste things, and crave them. 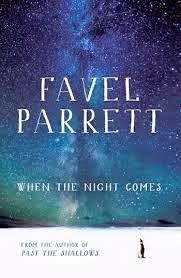 Favel Parrett's new book will make you wish for potatoes and custard and soup. In the late 1980s, Isla and her mother and brother move to Tasmania. Her mother is somewhat unhinged, that much is apparent, but the reason why is kept very close to the young narrator's chest. They struggle for a time, living in a dark house and renting out the one good room. They go to a Quaker school. Finally, they get a home of their own. And then some new friends come to town on a big red boat named the Nella Dan. Bo is a Danish sailor on the Nella Dan, who works in the galleys as a cook. The sea is in his blood; his father was often away from home on the very same boat and Bo remembers missing him for most of his childhood. In Tasmania, Bo meets Isla and her family, and forms a relationship with them that makes him question his commitment to the sea. But it is the relationship he forms with Isla; the impression that he leaves on her, which comes into question. This is a quiet, glacial novel in the most charming of ways. It consists of a number of short chapters, told alternately by Isla and Bo, documenting the important moments of 1986 and 1987. Deceptively simple, the emotions of this book creep up on the reader; for example, when tragedy strikes the small Quaker school; when there is an accident on the boat; when Bo soaks Isla's leg in chamomile tea to extract cactus spines from it. The scenes feel real, both those of childhood and on the boat. My one gripe with the novel is that it gives the outward impression of being about great loss, and truly it isn't. It's about the smaller losses, the series of hard knocks that each person must learn to live with and the litany of constantly closing doors which litter some childhoods. Isla does not appear to truly feel any of the losses. She registers being away from her father, losing her grandfather, the death of the boy at school, the departure of her favourite teacher and finally Bo's return to Denmark with a kind of quiet acceptance which seems to indicate that she has already indelibly inked them onto her heart, and will now be stoic about their leaving. This says a lot about her character. Not having read Parrett's previous novel, I find it difficult to make a comparison, but that would probably be of no use anyway. This was a quick read, and a substantial one, and I did thoroughly enjoy it, but it was not what I expected.